Did you know that cat scratchers are among the most essential furniture that your cat needs? It’s necessary for him but it also does a wonderful job at keeping him from scratching other nice pieces of furniture in your comfy home. 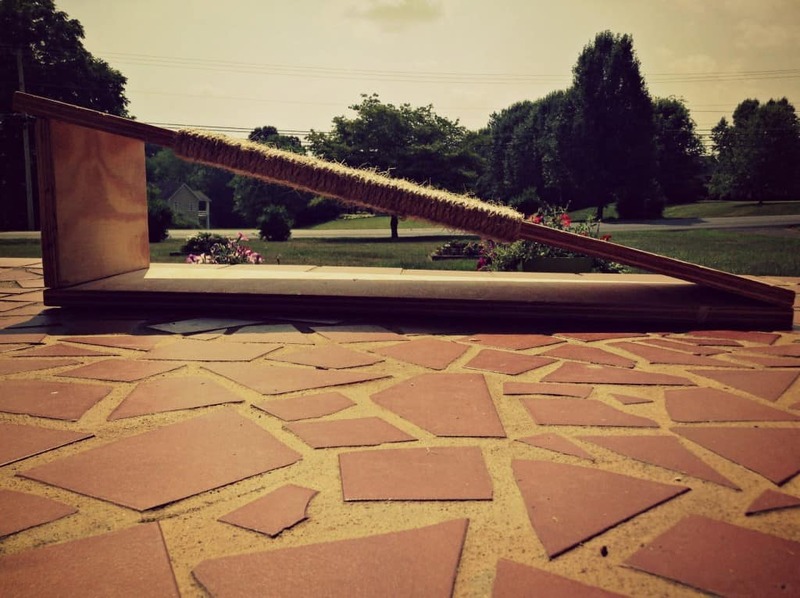 Although pre-made cat scratchers are widely available in pet stores or online, it is extremely fun and easy to make one with your own hands. It’s also a enjoyable project to do with your kids on a nice weekend. 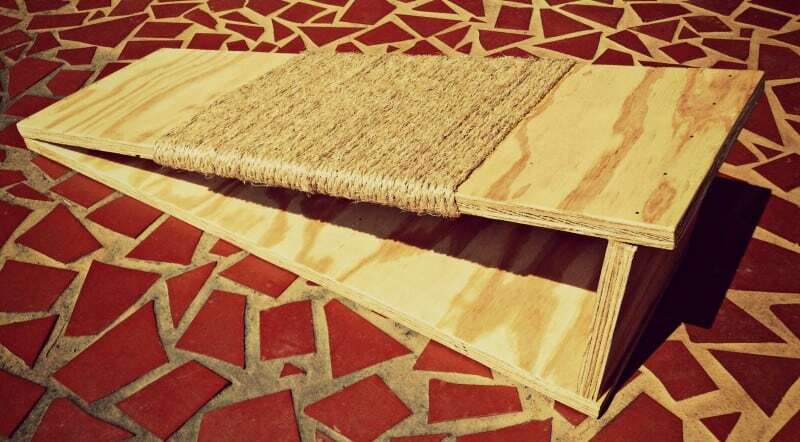 How to make a cat scratching board you ask? A little bit of wood, a little bit of sisal rope, and done! Well it’s almost that simple 🙂 let me give you a step by step guide on how to make a cat scratching board. 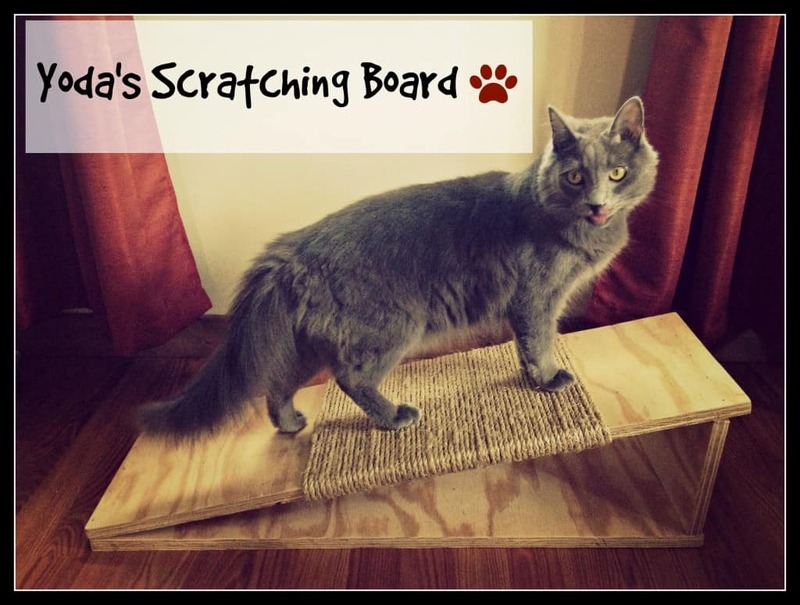 It is important to adapt the size and strength of your homemade scratching board according to your cat’s size or weight. For example, if your cat is real big (10 lbs+), you may want thicker wood that will resist the tremendous weight of this humongous beast 🙂 It’s also important that your cat has enough room to fully stretch on the board! 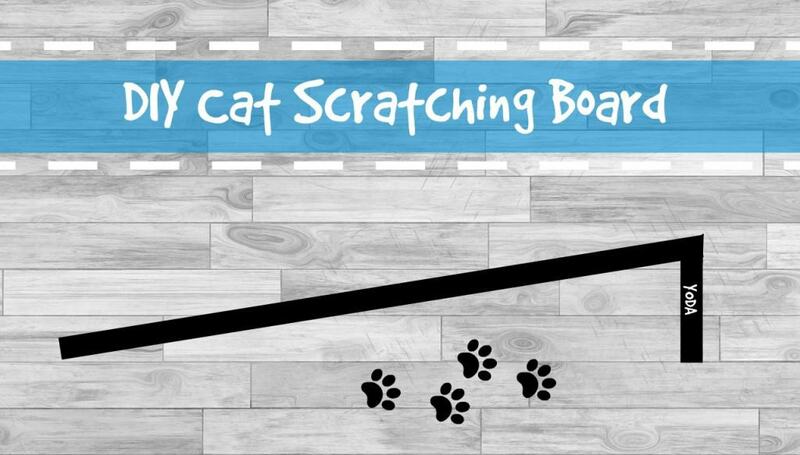 Whatever you decide, make sure you plan ahead and draw a simple plan of your desired scratching board. This step is essential as it enables you to make sure that everything will fall in place when you are done cutting the planks. My drawings and instructions are designed for a medium-sized cat (7-8 pounds). 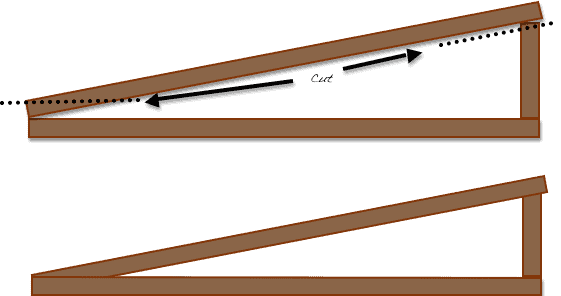 Measure and cut 3 planks that will be used to make the cat scratching board. The thickness of the planks is not indicated but it should be thick enough so your cat’s weight doesn’t bend the plank. Now that the boards are ready, it’s important that you choose whether to leave them like that or give them a personal touch. If the wood is not stained you could decide to keep it this way but you can also decide to apply some varnish or paint. If that’s the case, make sure you prepare your board before going into the next step. Whatever you decide, I believe it’s good to use sandpaper to smooth the edges and make sure your cat won’t end up with a splinter in his paws. Time to prepare the actual scratching board before assembling it to its support and base. Take the sisal rope, the glue and your stapler, things are getting real. Start by stapling the beginning of the sisal rope under the plank. Turn the board and use the glue to trace a straight line on the board where the rope will lay on. Go ahead and press the rope on the glue and pull as hard a you can to make it tight before rotating the board. When the board is turned, staple the sisal a first time close to the edge (1), pull as hard as you can again and staple it next to the other edge (2). Make sure you always staple on the same side of the board. This side will be hidden for visual purposes and also because it will prevent your cat from hurting himself on the staples. Keep on rolling! Simply repeat the same process until you are satisfied with the amount of sisal rope disposed on the board (or if you simply run out of it like me 🙂 ). From time to time, apply a line of glue to make sure it holds tight and remains straight. Do not use too much though, the staples should be strong enough except if your beast turns into a big green monster. It should look like this on the back side. And like this on the front side. Now you should have everything ready to start assembling the 3 elements of our cat scratching board! First assemble the support to the base. I used wood glue + a drill and a few screws to reinforce the structure. Now the tricky part is to put the scratching board on top of the support and base planks. You have two options here. Option one is the simplest and has a more rustic finish: don’t worry about it and just nail and glue the scratching board to the rest (just a thin line of glue). Its tricky because the contact area is relatively small. You need to be quite precise here and you might need extra hands to help align it perfectly while fixing the board. Option two is trickier but the end result will be a smoother look and a stronger structure: adjust the cutting angle of each board so they perfectly stick and align to each other. It’s easier to understand by looking at the images below. The original cut makes the contact points relatively small. 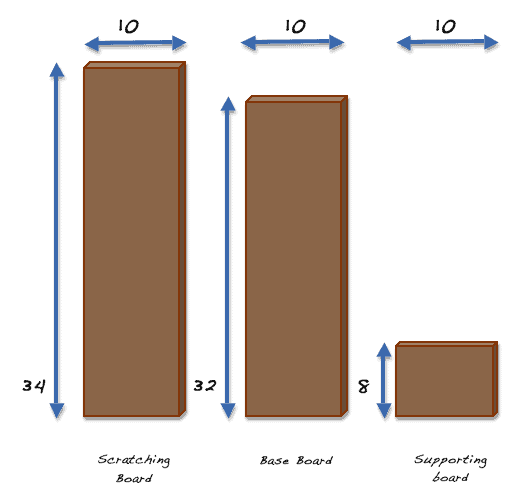 By cutting the edges at the right angle, the contact surface is greatly increased and enables to have the best performance in terms of strength of the overall structure (as pictured below). When you are done assembling this beauty, let it dry overnight. The glue might leak so make sure to protect the underlying surface. Keep an eye on it when you are just done, you might already see some excess glue that you can easily remove with a cloth. Now that your board is ready, present it to the beast! Give him some time to get familiar with it as he may be shy in the beginning wondering what this thing is. To help him out, sprinkle some catnip on it! Don’t force him or you will scare him and chances are he might not even want to use it after all. Create a positive experience and reward him with treats when you see him using it. Thanks for following us at Fluffy Kitty! Stay updated with us on social media to keep updated on all DIY projects and new articles. Previous Post Can Cats Eat Ice Cream | Treat or Threat? Hi Charley! Thanks for your support!